Open Window Publishing was founded by the author of Five Short Blasts. Our mission is to present a new economic theory that challenges the conventional wisdom of economists and sheds new light on incorrect assumptions upon which key domestic policies are based, especially those dealing with trade and immigration. 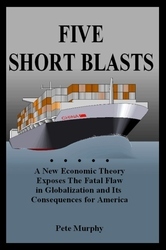 In this book (the title is derived from the maritime warning of the imminent danger of a collision), the author warns of an economic collision that is sinking the finances of Americans. He advances a brand new economic theory that has major implications for U.S. policies dealing with trade and immigration. This book is written in plain, easy-to-understand language and is intended for anyone concerned about the direction of the American economy. You won’t find another tired re-hash of the usual suspects blamed for our economic ills. This book nails the root cause and offers real solutions! Join in the discussion! Check out the discussion forum for an ongoing series of articles in which the author relates his theory and his recommendations to current events in America. You may begin to see things from a whole new perspective! Five Short Blasts 6"x9" Paperback 267 pages ISBN#978-0-9798505-0-9 $16.95 Free Shipping to All 50 States!! It's also available at Amazon.com! But there are two advantages to buying from Open Window Publishing: (1) Because Open Window Publishing ships via U.S. Postal Service media rate, our shipping cost is significantly lower, and (2) 25% of all profits are donated to charities devoted to helping America's poor. If you're located in the Cleveland, Ohio area, you can also find it on the shelf at Visible Voice Books in the Tremont area!